A Palestinian emergency worker holds a boy on a street flooded by sewage water. A high-level Palestinian source told Al-Monitor that not even one agreement had been achieved in the discussions so far, not even regarding marginal topics that were not defined as core issues. According to the source, not only has there been no progress, but there has been regression: Israel’s announcements about continued construction in the territories caused the Palestinian public to direct harsh criticism against its representatives in the talks, causing them (the negotiators) to harden their positions around the discussion tables. The highly placed source said that when the Palestinian team complained about this to Tzipi Livni, head of the Israeli team, she expressed her understanding of their perspective, but argued that this [the construction] reflected the Israeli political reality and, nonetheless, a way must be found to make progress. When the talks were renewed, representatives in the prime minister’s environs promised “surprises” and explained that he is ready to make a dramatic diplomatic decision that would avert Israel’s isolation. Netanyahu agreed to release prisoners with blood on their hands, and his associates said that he was willing to discuss all the issues on the table, including Jerusalem’s status and delineation of the borders of the future Palestinian state. The prisoners were, indeed, released but soon afterward provocative statements were released about building in the territories. The negotiators had not managed to touch upon even one critical issue before the negotiations exploded. Simultaneously, Economy and Trade Minister Naftali Bennett embarked on a media campaign in the United States where he argued that Israel was not an occupying nation because the entire land of Israel belonged to it. 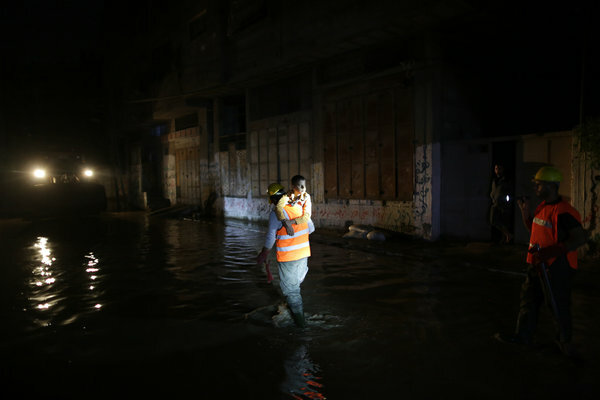 Raw sewage has flooded streets in a southern Gaza City neighborhood in recent days, threatening a health disaster, after a shortage of electricity and cheap diesel fuel from Egypt led the Hamas government to shut down Gaza’s lone power plant, causing a pump station to flood. Palestinians in Gaza faces their worst humanitarian crisis in recent memory. The Palestinian National Authority lacks the capacity to remedy the problems facing it’s citizens. Inaction fuels public resentment towards the international community in general and Israel specifically. An opportunity has presented itself for Israel to come to the rescue in a time of dire need, while also upholding its obligations under international human rights law. It would be hard even for the staunchest pessimist / cynic to argue that Israeli humanitarian aid would not improve public perception of the Israeli government, both in Palestine and abroad (where Israel has received much criticism of late due to controversial housing development plans in disputed territory). Palestinians are people just like anyone else, they will not forget who came to their aid in their darkest hour. I am Jewish, but I am not observant. However, one aspect of Judaism I have always identified with is the concept of Tzedakah (charity). The Israeli government–in the spirit of Tzedakah, in compliance with international human rights law, and in hopes of reinvigorating stalled peace talks–should come to the aid of Palestinians in Gaza. Categories: Blog Posts, Transparency Report | Tags: Gaza, Gaza strip, Human Rights, humanitarian aid, Israel, olive branch, palestine, Palestinian national authority, peace talks, sewage, two state solution | Permalink.